As a woman approaches menopause, she is likely to notice increasing irregularities in her menstrual cycle. During perimenopause, the body produces less estrogen and progesterone (i.e., the hormones that dictate the frequency and duration of menstrual bleeding) in preparation for menstruation stopping altogether. Irregular periods can be difficult to adapt to if you are used to regular menstruation. Some women use hormone replacement therapy (HRT) to regulate their periods during perimenopause. Keep reading to learn more about HRT as well as the benefits and drawbacks it offers as a treatment for irregular periods. HRT refers to taking estrogen and progesterone into the body as a means of replacing hormones during perimenopause. These extra hormones regulate the internal imbalances that cause a range of menopause symptoms, including irregular periods. For years, HRT was considered the most effective way of minimizing the symptoms of menopause. Though to some extent this remains true, a 2002 study by the Women's Health Initiative (WHI) made some disconcerting discoveries about the long-term health impacts of HRT, many of which are still being extensively researched today. This is not to say that using HRT to treat menopause symptoms is unwise, but it is better to be aware of its benefits and drawbacks before considering it as a treatment. 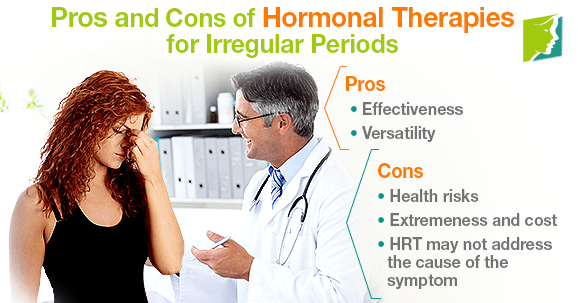 Read on to learn the pros and cons of using HRT to treat irregular periods. Effectiveness. Estrogen replacement has been found to be an effective form of restoring internal hormonal balances and regulating periods, and it is also likely to reduce other life-impeding symptoms of menopause, such as hot flashes, vaginal dryness, mood swings, and night sweats. Versatility. HRT can be administered in whichever form is most convenient to the patient, or most suitable to the symptom it is treating. This encompasses a diverse selection of forms, including vaginal creams, gels for the skin, tablets, vaginally-inserted rings, pills, or injections. HRT for irregular periods would most likely be in tablet form, which can be conveniently worked into your daily routine. Health risks. HRT is still being researched today, but scientific findings thus far have linked the use of HRT with increased risk of contracting serious health conditions, including blood clots, heart attacks, breast cancer, strokes, and gall bladder disease. This form of therapy should therefore not be taken lightly, or without a full discussion with your doctor about the risks involved, based on your age and medical history. Extremeness and cost. The artificial input of hormones is a fairly drastic form of action for a symptom which could be treated with lifestyle changes or herbs. Click here to learn habits, dietary adjustments, and herbal remedies that can regulate periods naturally and more affordably than HRT. HRT may not address the cause of the symptom. Irregular periods are a common symptom of menopause, but the menstrual cycle is also closely linked with stress, contraception, and extreme weight loss - factors that HRT will not affect. It is worth evaluating how your lifestyle is influencing your menstrual cycle; adapt it where possible and consult with your doctor if you are concerned about your stress levels, extreme weight loss, or choice of contraception. Herbal supplements and lifestyle changes should be considered before turning to HRT, as these are a less risky way of minimizing the symptom and are likely to regulate your periods over time - to learn more about this, click here. Ultimately, HRT is most advisably considered as a last-resort treatment for irregular periods, after consulting with a doctor to discuss its suitability based on age and medical history.